Mexico City’s April 2013 Cyclotón. Photo by Benoit Colin/EMBARQ. Implemented in 2010, Mexico City’s Ecobici bike-sharing system has grown from 90 stations and 11,000 members in its first year of operation to 271 stations and over 75,000 members today — covering new ground and reaching more residents. TheCityFix interviews Julie Clerc, Gisela Mendez, and Awen Southern — three cycling experts from Mexico who guide us through ins and outs of life on two wheels in Mexico City and beyond, and enthusiastically share their insight on the country’s cycling future. 1. What are some of the unique benefits of cycling as a form of transport in Mexico? Awen: Bicycling in Mexico City is in many cases faster than using a car or even public transportation. The city is a gigantic, a sprawling city of 20 million inhabitants, yet most trips are no further than 7 kilometers (4.3 miles), or a 30 minute bicycle ride, and largely concentrated in the center of the city, where the land is flat, and public bicycles are available. 2. This February marked the third anniversary of the Ecobici bike-sharing system — the largest year-round bike-sharing system in North America. What’s next for bike-sharing in Mexico? Awen: While the Secretariat of the Environment, which has been leading Mexico City’s Bicycle Mobility Strategy since 2007, has concentrated its efforts on improving the maintenance and quality of Ecobici service, the first months of 2013 brought a new focus on infrastructure development of the City’s main arteries. Gisela: Cycling is not exclusive to Mexico City; every major city in Mexico is promoting cycling as a transport form, but no national policy, nor a local policy, currently exists that allocates public funds for it. The small bike-sharing system called @Bikla, in Guadalajara, is run by a private company formed by young activists, industrial engineers, and entrepreneurs. The system still runs privately without government support. Next for bike-sharing is the goal to establish the recognition required to scale up as a public policy with a budget attached to it. 3. Can you identify one big step and one small step cities can take to make cycling safer on Mexico’s streets? Julie: Changing the transport culture in a way friendlier to both pedestrians and cyclists is one of the major goals, but one small step cities can take would be to provide the appropriate infrastructure for biking, such as the implementation of road space dedicated to cycling lanes. Gisela: Cities need to talk to citizens and show that the urban space is built for all, with equity and safety in mind. The next frontier for the cycling movement in Mexico has to prove that a safer infrastructure needs to be designed and implemented. One big step would be to budget funds for cycling as a public institutionalized policy. Awen: Mexico City is now developing a series of communication campaigns to raise awareness regarding road safety, including the OJO al Rebasar, Cuida al Ciclista (“Watch Out for Cyclists”) campaign, led by the Secretariat of the Environment, and La Calle es de Todos (“The Street Belongs to All”). However, no campaign will ever be effective if they are not supported by a concrete investment in bicycle infrastructure improvement and car-use regulations. A bigger and necessary step to take would be to train bus drivers to provide them with a more holistic vision of urban mobility, in which transportation is not conceived as a fight of interests opposing different modes of transportation or technologies, but rather, as an integral system where intermodality is valued and prioritized to serve the changing and flexible needs of the community. EMBARQ Mexico is already taking a step in that direction by training all Metrobus drivers on road safety this year. 4. 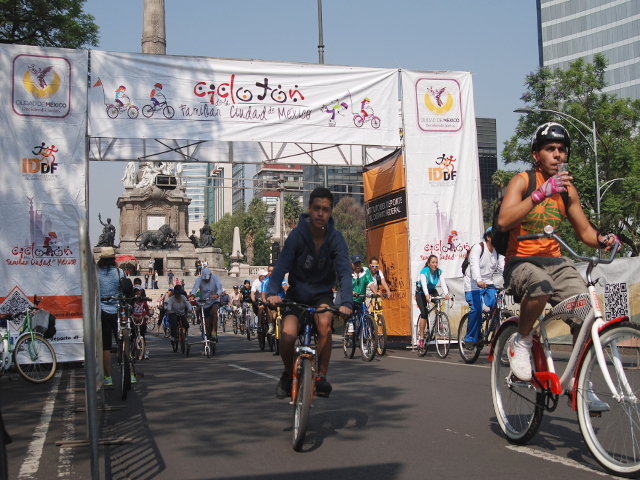 The 6th anniversary of Muevete en Bici, Mexico City’s Sunday closure of its main avenue to motor vehicles– was May 12th; in the last six years, has Mexico City’s cycling culture, or the public perception of cycling, evolved? If so, in what ways? Awen: To my knowledge there is no study that has measured or analyzed the perception of cycling in Mexico City before and after the implementation of the Muévete en Bici initiative. However, a recent survey of Muévete en Bici participants revealed their largely positive perception of and support for urban cycling in Mexico. Muévete en Bici provides a sensorial experience of the city we want to live in. The bicycle is but one tool to articulate a vision of the city as an ecological system: a place where public health, social cohesion, economic activity and the balance between the natural and built environments are all intrinsically linked. Gisela: The culture has evolved because cycling proved to be possible in the city. Most of all, children are learning that our city is bike-friendly, and that is the most valuable lesson our generation can give to the generations that follow. 5. Are there ways in which cycling could be better integrated with other forms of public transport? Where do you see potential? Gisela: Cycling infrastructure has to be seen as feeder for public transit and not as competition for users. Our cities need to show that integration allows security in mixed modes for complete journeys. The same city has other cities within, people move differently and the strategies to meet those needs can be made through different integration approaches. Shifting our travel preferences can be possible only through flexibility, security and variety of choices for everyone. Julie: The best way of supporting further transport integration would be to provide the infrastructure in metro, bus, and train stations to park a greater number of bikes — not simply two or three areas. 6. Is there an additional topic you would like to discuss? Awen: The interest of Mexico City’s government for urban cycling in the past few years has opened new roads of collaboration between the public and private sectors and the civil society. In that process, new cycling associations have emerged, such as Mujeres en Bici, who organizes training classes for women within the city programs Muévete en Bici and BiciEntrénate. The award-winning Manual of the Urban Cyclist is also a joint product of Bicitekas and the Secretariat of the Environment. New independent movements are starting to emerged, such as the successful Paseo de Todos, a pacific critical mass organized by a group of citizens every first Thursday of the month, attracting between 1,000 and 2,500 riders to each event. Mexico City’s cycling culture is infused with multiplying groups and ramifications that are increasingly connected through national networks such as Bicired. The travelling exhibition Por mi ciudad en bicicleta, launched by several organizations in 2012, aimed precisely at connecting different cycling cultures across the country, while identifying local needs and favoring information sharing among cyclists organizations. Mexico’s cycling culture is also reinforced by an increasingly technical civil society that actively participates in the shaping of the public debate and public policy, releasing strategic reports such as Hacia ciudades saludables y competitivas: Moviéndose por un aire limpio (“Towards Healthy and Competitive Cities: Moving for Clean Air”), submitted in June to President Enrique Peña Nieto by a collective of organizations including cyclists associations like Bicitekas and Fundación Tlaloc, and organizations such as El Poder del Consumidor, the Mexican Institute for Competitivity, and EMBARQ México, among others. 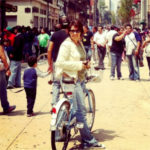 For more information on cycling in Mexico City, check out EMBARQ Mexico or read the recent report. 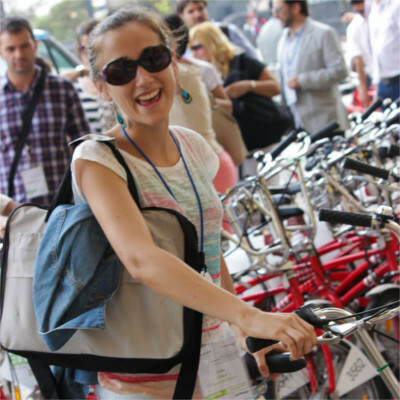 Awen Southern is a consultant in Urban Mobility Communications and an active member of the Americas Ciclovias Network. Based in Mexico City, she collaborates with the Pan-American Health Organization in partnership-building and city-to-city facilitation. Awen has worked with both government and civil organizations, including the Secretariat of the Environment in Mexico City and EMBARQ Mexico, to promote sustainable urban development and active transportation. Gisela Mendez is an architect, specializing in an urban planning and the evaluation of urban policies. She has worked for local governments and helped to harness the power of cities to change everyday lives, especially through public participation and community design in the creative planning processes. She considers planning as the most important momentum for knowledge sharing among actors and key to affecting change. She joined EMBARQ Mexico last year to coordinate the National City Network. Julie Clerc returned to EMBARQ Mexico as a junior analyst in urban public policies, after working as an intern on EMBARQ Mexico’s Guide for Sustainable Communities in Mexico. She is interested in questions of urban mobility and urban poverty in Latin America, specifically in Mexico. Everyday she commutes 18 kilometers (11 miles) by bike to go to work and loves it! Thank you to Yasmin Khan for her assistance in facilitating this interview.